Black Puta were the only undefeated team in the competition and lived up to their tag of favorites by overpowering the Avatiu No Girls in the first half after the scores were at 2-0 on the half-time whistle. Black Puta’s Campbell Best opened the score when his side was awarded a free kick. Best was left unmarked when the ball was slipped to him to place cleverly pass the Avatiu’s goal keeper. The Avatiu No Girl’s defence broke again when Black Puta’s Roger Manuel dribbled past the defenders towards the goal before firing a low shot past the Avatiu goal keeper and into the far side of the net to send the Black Puta supporters into ecstasy. Black Puta went on score another two goals before the final whistle however Avatiu No Girls redeemed themselves with their only goal through Nathan Tisam to bring the final score and win to Black Puta by four goals to one. 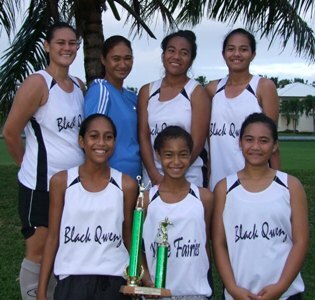 In the women’s final Black Qwenz took top honors in the knock-out competition after defeating Avatiu No Boys by two goals to one. Avatiu No Boys put pressure around the Black Qwenz box and was awarded with an early goal by Louisa Manico who sliced the ball past Black Qwenz goal keeper Melanie Wilson. Black Qwenz replied minutes before the half time whistle through Teiti Tupuna to level the score. The passing combination of Mii Piri and Elizabeth Harmon enabled striker Teiti Tupuna to score the winning goal late in the second half with the final score of Black Qwenz 2 – Avatiu 1. There was no further score for the remainder of the half but it was the Avatiu No Boys side who looked most likely to strike but shots were wide of the goal and time running out to send cheers for the Black Qwenz celebration. Black Puta and Black Qwenz were unbeaten throughout the round cup competition claiming the round cup title and adding the knock-out title to their names. Cook Islands Football would like to congratulate the two winning teams and all the teams who took part in this year’s Rarotonga five-a-side soccer competition.